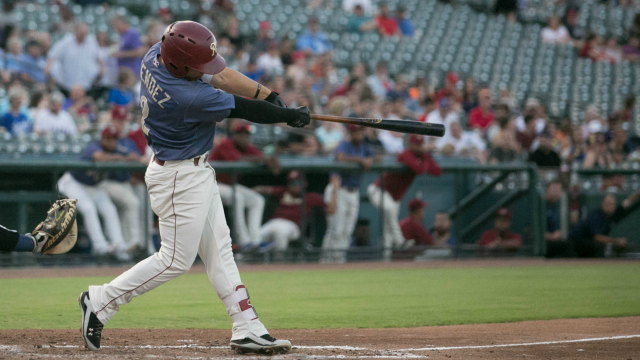 FRISCO, Texas (August 30, 2018) - Luis Mendez blasted a home run but the Frisco RoughRiders, the Double-A affiliate of the Texas Rangers, couldn't overcome an early Hooks lead and fell 3-1 Thursday at Dr Pepper Ballpark. * The Hooks commanded a 2-0 lead in the first after a trio of base hits. * Luis Mendez scored the sole Frisco run, a home run in the third inning. * Wei-Chieh Huang threw two hitless innings of relief, only allowing a walk and striking out three. * Delino DeShields went 0-for-2 with two walks in his third rehab game with the RoughRiders. * The loss makes Friday's contest against Corpus Christi a must-win for Frisco to stay in playoff contention. * Friday is the last home game at Dr Pepper Ballpark of the regular season. Riders vs. Corpus Christi, Friday, 7:05 p.m. The Frisco RoughRiders are the Double-A affiliate of the Texas Rangers and play their games at beautiful Dr Pepper Ballpark in Frisco, Texas. The team was founded in 2003 and has finished first among all Double-A franchises in attendance in each of the last 13 seasons (2005-2017). In August 2014, the RoughRiders were purchased by an ownership group led by Chuck Greenberg. Since then, the new ownership group, together with the City of Frisco, has spearheaded numerous major franchise enhancements, investing over $8 million in a wide array of facility upgrades and improvements, including a state-of-the-art HD video board, sound system, Bull Moose Saloon, InTouch Grille, Riders Outpost Team Store and the world's largest water feature in a sports facility, the massive Choctaw Lazy River. These enhancements earned the Riders and the City of Frisco Ballpark Digest's prestigious "Best Ballpark Renovation" award for two consecutive years (2015 and 2016). More than 140 former RoughRiders players have gone on to play Major League Baseball, including All-Stars Chris Davis , Adrian Gonzalez , Ian Kinsler and Neftali Feliz , as well as current Rangers stars Elvis Andrus , Rougned Odor and Nomar Mazara . For more information on the Frisco RoughRiders and Dr Pepper Ballpark, please visit RidersBaseball.com or contact Ryan Rouillard at RRouillard@RidersBaseball.com.